You CAN ensure safe crane operations. 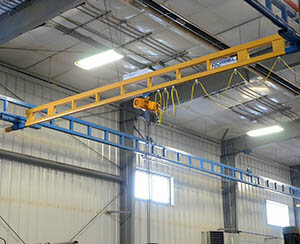 Many of our client companies rely on their overhead cranes to lift and transport materials every day. They quickly come to see their lifting system as an integral part of their process that speeds up production. When installed and used properly, with training, servicing, and inspections in place, these systems make operations easier and safer as well. However; despite best efforts, accidents can happen and an analysis of overhead crane accidents reveal three common safety hazards that every company that operates overhead lifting equipment should be aware of to keep workers safe. The three most common hazards that you should be on the look out for including electrical hazards, overloading, and material slippage. We look at each hazard in detail below with ways to avoid them and prevent them. One common element of all crane hazards is operator qualifications. It is the responsibility of the owner and job supervisor to ensure only qualified people operate lifting equipment – click here to read about our partnership program with Safety Services Manitoba to provide training to your crane operators. Many shops run power lines throughout the shop and these lines can vary from day to day depending on operator need. A pre-inspection of the area that the crane will be operating is crucial to avoiding electrical hazards. Never assume that the area the crane will be operating in is clear of obstructions – check every time a lift is made. In cluttered areas or where visibility is limited operators should have fellow workers observing nearby to assist them. Also, where possible, be sure that any ladders, tools, and systems are non-conductive in case they are knocked over onto power lines. There is very little electrical hazard risk from the crane’s electrical system, but again, never assume that nothing has changed from the previous use. Visually inspect the crane, and its electrical system, prior to any use of the system. Almost all crane upsets and structural failures can be attributed to operators exceeding the crane’s operational capacity. All crane components have a clearly identified maximum capacity and if an operator exceeds this structural stresses that may cause irreversible damage greatly shortening the lifespan of the system. Other causes of overloading a system include swinging or sudden dropping of the load, using defective components, hoisting a load beyond component capacity, dragging a load and side-loading. If your lift is continually lifting near maximum capacity you should look at upgrading your system to prevent premature wear on system. While it may be safe to operate near capacity, continually operating at maximum capacity can shorten the life span of your hoist and system. We speak about duty cycles in this article. Acculift’s crane specialists can help you select a system to match your needs to get the most use from your lifting system. Overloading most often occurs when untrained or new personnel operate cranes. New operators tend to over estimate a cranes capacity and under estimate the load weight. Training and planning can greatly reduce the hazard of overloading and operator incompetency. Formal training, on-the job supervision, and safe operations procedures can almost entirely eliminate overloading. Cranes are easier to use than ever before, with sophisticated technology behind them. Unfortunately, this means operators may feel that they don’t require training to operate the lift but realistically, for government safety requirements, your operators need to be well trained and have a clear understanding of load dynamics, lifting capacities , and the conditions in which overloading can occur. Many companies use lifting equipment for loads that are heavier than people should be moving manually which means that most lifts involve a significant weight. Objects that aren’t secured properly can slip and crash to the floor below. Regular inspections of hoists and crane equipment are essential to preventing dropping of loads due to equipment failure. Load testing during ensures that the crane’s rated capacity is still valid. Servicing and maintenance should always be treated seriously when it comes to heavy machinery. Daily inspections, use of lockout tags, yearly certified inspections, and operator training are all key factors to ensure safe operations. The two factors of a lift, weight and movement, are the ingredients for a catastrophic result from equipment failure. Employees should understand that every lift creates a danger zone that is to be respected. Never walk under a lift, whether stationary or moving. Improper securing of the load is one of the leading causes of dropping loads with overhead hoists and cranes. If the load is insecure or off balance during a lift it may tip and drop. Training and experience with the load and lift will help to prevent insecure loads. Never be in a rush when securing a load and operators should be well versed in proper securing methods for the type of material they are moving. This is where the proper end effector, or below the hook device, can prevent dropping of materials. maintain focus at all times on the task at hand. Ultimately, it comes down to operator knowledge of safe crane operations and implementing safe work procedures. Like any task on a work site, proper training, awareness, and focus on the work are the keys to preventing accidents. Manitoba has the SAFEWork program that helps employees to be aware of safety and can help you promote a “safety first” culture in your workplace. In the end, even one accident is too costly for business if it could have been avoided. Calculate the ROI on an upgraded crane system for your business using this quick handy form.